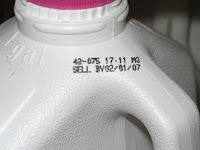 Now, I don’t want to rant here, but here’s my problem with dairy companies around the United States, they aren’t consistent with their expiration dates. Some, like the picture to the left, say “Sell by” a certain date. Is this some sort of warning to grocery stores or to the consumer. Does this mean you have to sell by 2/01/07 and it’s okay to drink until it starts looking like cottage cheese or does it mean, don’t drink this stuff after 2/01/07 or you’ll end up projectile vomiting? And that’s not the half of it, other dairies, just put a date on the label. What the heck does that mean? And I love all of the people you ask whether the milk’s still good and they say smell it. Have you ever taken a whiff of bad milk? Bad news! They say never present a problem without a solution so here’s my humble suggestion. Let’s all agree to put a “Best If Used By” on the label. Then, there’s no confusion whether the milk’s bad. I enjoy milk but I don’t want it making me sick. You know it does a body good, right?